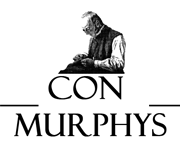 Con Murphy’s has years of experience producing quality formal and casual clothing for men. The brand and shop alike has been passed down through generations, keeping the family name strong. The quality of their Suit offer is always 1st class, and the fittings are always consistent.